Official white mug with album cover of "Butchered at Birth". Official black mug with the 1st album cover. Official black mug with album cover of "Evangelion". Official black mug with album cover of "Burzum". Official white mug with album cover of "The Legacy". Official black mug with the "The Return..." album cover. Black army cap with grey logo. 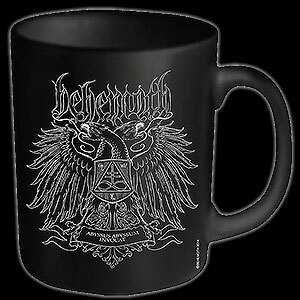 Official black mug with album cover of "Det Som Engang Var". Black army cap with red & white logo. Black army cap with white logo. Official black mug with album cover of "Eaten Back to Life". Official white mug with album cover of "Brotherhood of the Snakes". Official black mug with CANNIBAL CORPSE logo in red.